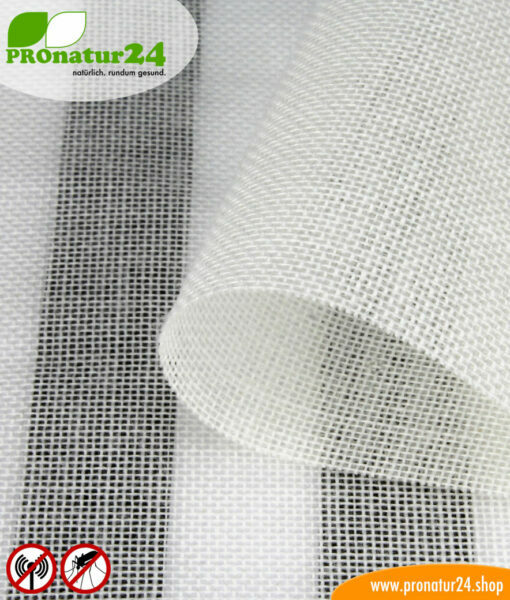 NATURELL is an effective and very optically appealing shielding fabric against HF electrosmog caused by mobile radiation. Eco-cotton wool is combined with copper and silver and ensures a high attenuation of up to 38 dB, even up to 53 dB with two layers. 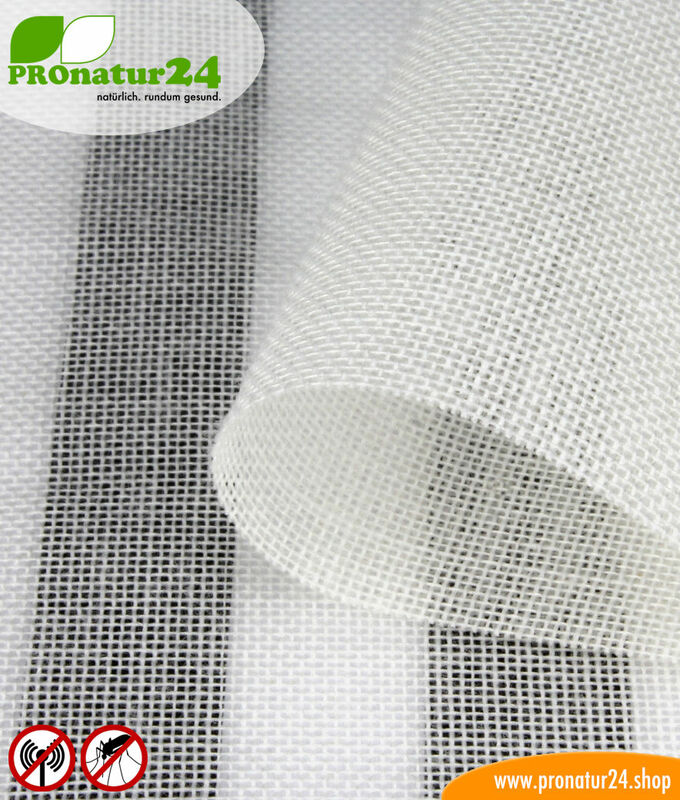 NATURELL™ shielding fabric against HF electrosmog caused by mobile radiation (mobile radio, WLAN, DECT…). 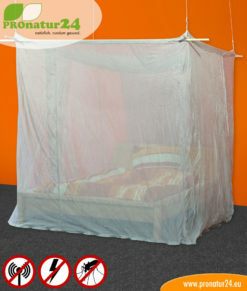 Ideal for shielding against radio pollution with a curtain or canopy. This very attractive NATURELL shielding fabric is excellent for curtains and canopies. Because the woven, radio-reflecting silver threads are insulated for protection, there is no oxidation with oxygen and, as a result, the NATURELL shielding fabric’s color does not fade with time. The curtain or canopy equipped with the NATURELL™ will stay there in its natural ECRU-WHITE color for years. The NATURELL™ shielding fabric by Swiss-Shield® is a half-transparent cotton wool fabric for protection from high-frequency electromagnetic fields (HF) from transmission masts and private devices such as mobile phones, smartphones, WLAN routers, mobile LTE Internet, etc. It should be noted, however, that this NATURELL™ shielding fabric cannot be earthed. NATURELL™ is not electrically conductive, so protection provided by reflecting invading mobile radiation is limited. 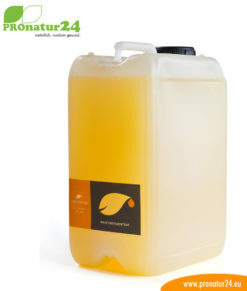 The NATURELL™ shielding fabric is made out of a special eco-cotton wool tissue. This patented high-tech yarn is made of 82% cotton wool, 17% copper and 1% silver and reaches attenuation values of up to 38 dB, even up to 53 dB with two layers. 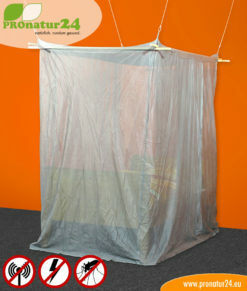 Ideally, the NATURELL™ needs to be used for curtains and canopies because of its transparency. Our Electrosmog FUNK canopy is made out of this shielding fabric. Screening attenuation: 38 dB; 53 dB with two layers. All values provided apply for 1 GHz. Measurements done according to ASTM D4935-10 or IEEE Std 299-2006 or IEEEE Std 1128-1998 or ASTM A698/A698M-07. Please note that cancellations do not apply to these products, because they were cut to the customer’s specifications. Reselling a tailored item is no longer possible. 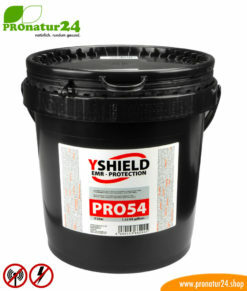 For this reason, it is possible to request a free sample of the NATURELL™ shielding fabric. By ordering pre-finished products, waiving the statutory right to return goods is accepted. We only sell the highest-quality fabrics! 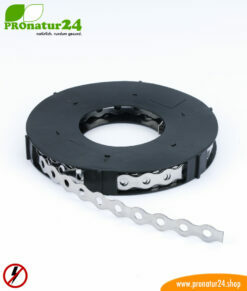 Because of the high production costs and a favourable price, small flaws are not grounds for complaint.